A commenter on this blog called aem was asking about distillation. I reckoned it was hard to come up with a few sentences in answer, much easier to ramble on. And the short answer is, it isn’t much. At this point I have to say that the “not alchemical” I mean with regards to Heironmous Braunschweig is that he was distilling plants for medical reasons. At the time, this wasn’t really alchemical; it certainly wasn’t transmutational. 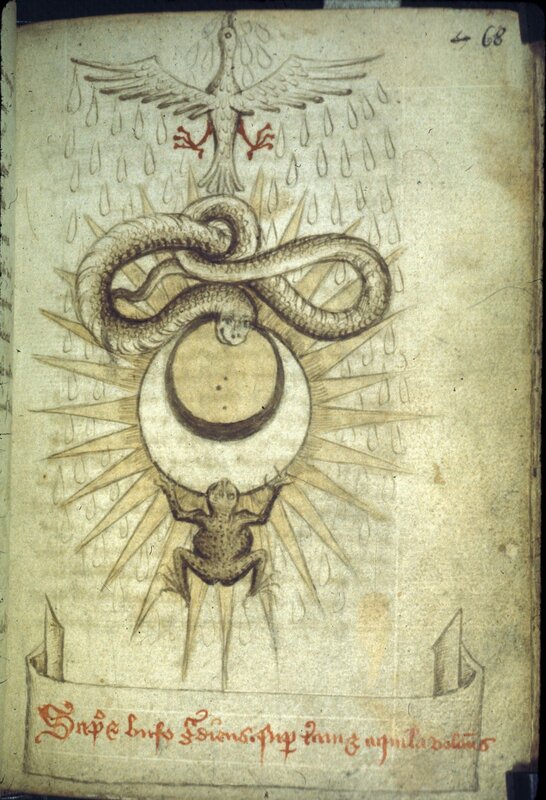 The interplay between medicine for the body and alchemical work was long an issue, insofar as John of Rupescissa with his “Book of the quintessence” is taken as being the modern starting place of the merger between alchemy and medicine. It was written in the mid-14th century, 150 years before Heironymous. Before that, distillation was used on wine to make spirits, which were then used for medical purposes, including distillations with plants in them. The real Arnold of Villanova was keen on that sort of thing. So the distillation tradition of Heironymous is separate but parallel to that of the alchemists. The actual mechanics of distillation aren’t different between alchemy and medicine. Or rather it depends what want to do with it. The differences are usually driven by the difference substances to be distilled. So, alchemists use glass as much as possible because it is unreactive, whereas medical distillation works fine in copper or pottery vessels. Pottery vessels can’t cope with high temperature distillation so aren’t much use for alchemical high temperature work. Yet Vannoccio Biringuccio (1542 book De Pyrotechnia) describes in detail how to carry out distillation using glass vessels for making acid, an activity seemingly invented and used by alchemists over 300 years earlier. Vannoccio says you can use lutum sapientiae to cover your cucurbits for distillation, and attributes that name to it. Heironymous attributes it to Arnold of Villanova, but I wonder whether the original Arnold used that term, perhaps he did. Study of the early stages of non-alchemical distillation is difficult because of lack of evidence and also lack of transcription of the works of the real Arnold of Villanova and other experts in the 13th century. It mentions the English translation of the book of distillation, but I can’t find it again, I am sure I saw a scanned copy of it somewhere online. Alchemists certainly distill a wider variety of stuff, often including mercury and arsenic and various dissolved substances. Then there are the metal acetates, which don’t crop up much in medical chemistry but do in the works of Ripley and suchlike. If you want more on the alchemy/ medicine distillation crossover, an earlier period of it was that of Ar Rhazi, in Iraq in the 8/9th centuries AD. At that point they were basically throwing anything and everything into a cucurbit and distilling it, getting all sorts of waters of dubious use. The waters could then be used to do alchemy. I understand that a lot of medical waters were also made using distillation, but am not aware of any sources or papers discussing it, at least in English. So, short summary is that distillation became widespread in western europe, but the alchemists had played a major part in knowledge transfer and also pushing the boundaries of what was possible in terms of equipment and what to distill. Methods were very similar, but with different aims and thus different recipes. Whoops, it really has been a long time since I last posted on here. Ah well. 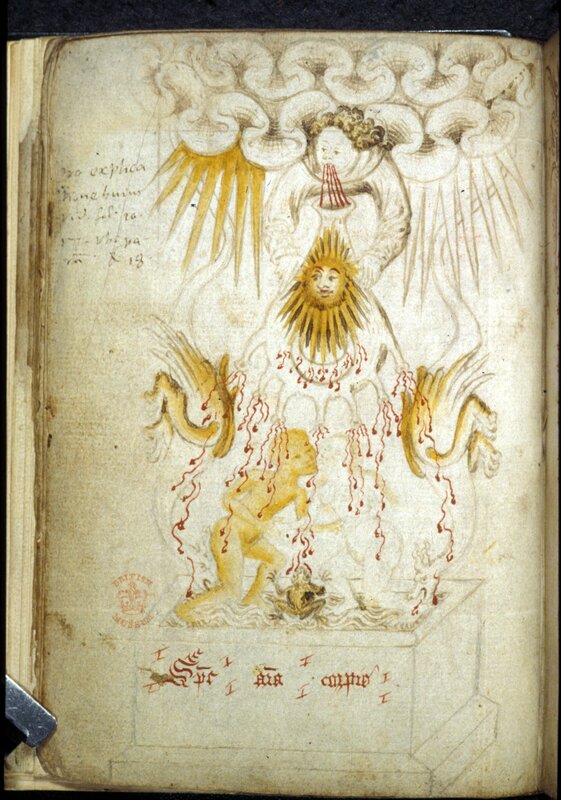 I have been following the British library’s MS digitisation program for a while, waiting for it to get to alchemical works. Unfortunately the one linked to above seems to have been oddly labelled. 2. Marbod of Rennes, Liber lapidum seu de gemmis (ff. 39r-54v); ( about gemstones, no mention of alchemy according to my sources, but of course discussion of the 4 elements in how gems are formed. 3. Pseudo-Ovidius (Thierry, abbot of St. Trond? ), De mirabilibus mundi, hexameter verse (ff. 54v-57v); ( appears to be a Roman era collection of natural history, geography etc, by Gaius Solinus, but here seemingly attributed to someone else. 9. ‘Tractatus super Arithmeticam’ (ff. 87r-114r); (Seemingly a mathematical treatise, not much information to be had. 10. Johannes de Sacro Bosco, Computus (ff. 114v-144); (More mathematics?, but not much info on it can be found. 12. Pseudo-Ovidius, De vetula, excerpt (ff. 147r-147v); (This is a 13th century elegiac comedy written in Latin. 14. Chronicle relating to the year 1291 (ff. 160r-177v). (I cannot read it, but it seems likely that a chronicle isn’t about alchemy. Note the general lack of actual alchemical texts. The “Composite miscellany relating to medicine, alchemy and mathematics” (quoting from the BL description) itself is from the 2nd half of the 13th to mid 14th centuries. I suppose the nearest modern equivalent would be a pile of university level textbooks on a variety of topics, especially maths, plant based medicine, and some religious thought. It should be emphasised that the works in this collection are not the sort of populist type of book you might be familiar with nowadays; the very fact that they are written in Latin means that only the tiny fraction of the population who were literate in it means they were for the intelligentsia, hence my description as university level textbooks. Chiromancy is basically palm reading, but looks at the entire hand, not just where some of the lines on the palm are. Interesting to find it in such an early, scholarly text, but it seems it is a definite interest of medieval scholars, even if not actually treated as a part of their intellectual endeavours. It seems to have been something of a holdover from older ideas about how the world worked. Marbod himself lived from about 1030’s to 1123, and seems to have had homosexual attractions but did not believe in actually consummating them. Now, in summary, the manuscript Harley 3353 can be said to be evidence for a person or persons interested in many things about the world, how it works, how it is structured, etc, and dedicated to thinking about all this in a way which is not exactly familiar to modern folk. Yet I can find no definite evidence for alchemy in the texts within it, so the question is, why does it have that tag attached to it? Maybe I should ask the BL. A fairly simple way of dyeing cloth in the medieval period was to use oak galls, although I have no idea how often it was done. The tannins within them act as a mordant, so you don’t need that expensive import, alum. Then if you add some iron you can vary the shade, iron being fairly easy to come by, at least by the late medieval period. So I prepared two examples, using fairly fresh oak galls gathered at the weekend. Following the instructions given in “Colours from nature” by Jenny Dean, you can get black after adding green vitriol (Iron sulphate) to the tannin solution. I roughly followed her instructions; at this stage I don’t care about exact yields, just proof of process. This was then strained through some linen like the first lot, and heated with the cloth in it. I took the cloth out three times to allow it to air, as Dean says, and boiled it again every time it went back in. Finally I took it out and allowed it to dry. Simple enough anyway. The black looks pretty good even after rinsing, but because of the acidic nature of the green vitriol it will be interesting to see if it suffers any damage over the next year or two. The brown is more a light tan, which would itself be acceptable I am sure, although I’m not sure how to get the dark brown of some clothing. Perhaps walnut hulls or copper moderated madder, from what Jenny Dean writes. I think I need some more books on dyeing though, to cross correlate the information. I started hillwalking again in 2014 after a gap of 6 years, and at the end of October climbed my first Munro and first new to me Munro since early 2008. A few days later I was recalling how good it felt to get outside and uphill, when I remembered that mountains feature in some alchemical works and ideas. So the question is where, and what do they mean? The first obvious point is that mountains are high, lofty palces, closer to God in his heaven, and part way between the earth and the sky. So they are set apart from the earth itself, and of course you can see a long way from the top of them. Hmm, well that might be a veiled allusion to distillation and what collects in the alembic. Which is good, because of the money (I don’t have the knack of self promotion and persuading people I do actually have the stone), but leaves me a bit knackered. I’ve got a few more experiments to write up nevertheless, you should see them over the next couple of weeks. I don’t know what it is. The ash had a yellow tinge to it, and when I used it to try and make KOH it left me with this bright yellow solution. Funky colour, shame I don’t know what causes it. It is likely a water soluble oxide of some sort; when I had an accidental fire last year some plastic and an old paint can with paint in it got burnt, and plastic often has metallic compounds in it to give colour and make it more light resistant. Metal compounds used include iron, barium, antimony, lead, nickel, chromium. Some of these aren’t very nice, so this is one substance I definitely won’t be tasting. The analytical problem is that to carry out a simple flame test the potassium and sodium of the ash would probably mask any other colour present, since they are there in such quantities and give such bright flames. 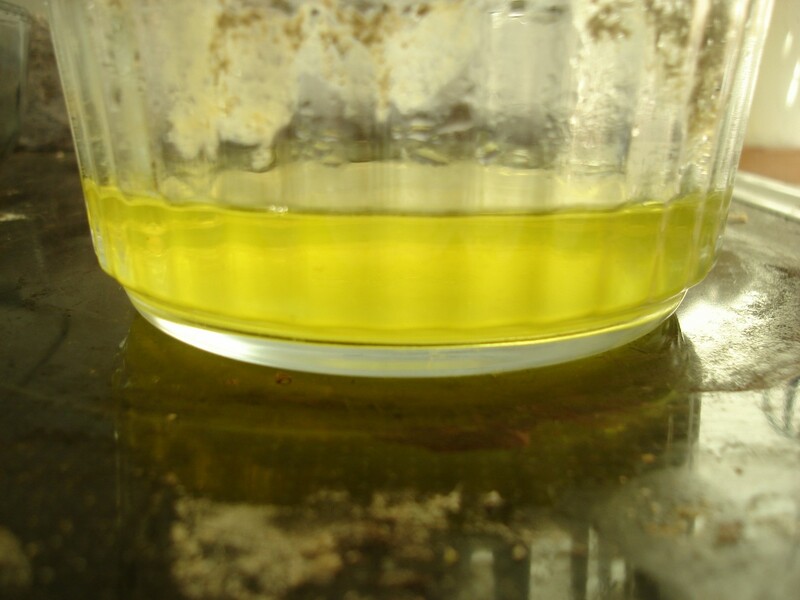 One thing to try was to neutralise the KOH and CaOH present by the addition of vinegar, and see what that did to the colour. I took a sample and added acetic acid, it foamed and bubbled nicely, and the solution cleared slightly, but is still bright yellow. Now to work out how to separate the substances that are in solution. I’ve been very busy. Normal service will resume in about 2 weeks time, hopefully with some news and useful posts.